Wilmington, Del., October 24th, 2015 -- New Castle County Patrol Officer J. Smith responded to the 100 block of Fairhill Drive in the community of Limestone Hills, in reference to a credit card fraud. The reporting person and victim advised that his credit card number had been compromised and there were several unauthorized transactions. The victim reported having his credit card the entire time and suspects that his number was obtained some other time. Officer J. Smith began an investigation and noticed that several of the charges were made at two Newark area businesses on October 14th. Video surveillance from those businesses was obtained as part of the investigation and seen on the surveillance was two black males making purchases using the credit card number. The subjects in the surveillance are described as two (2) black males one being heavy set with a full beard and possibly bald. 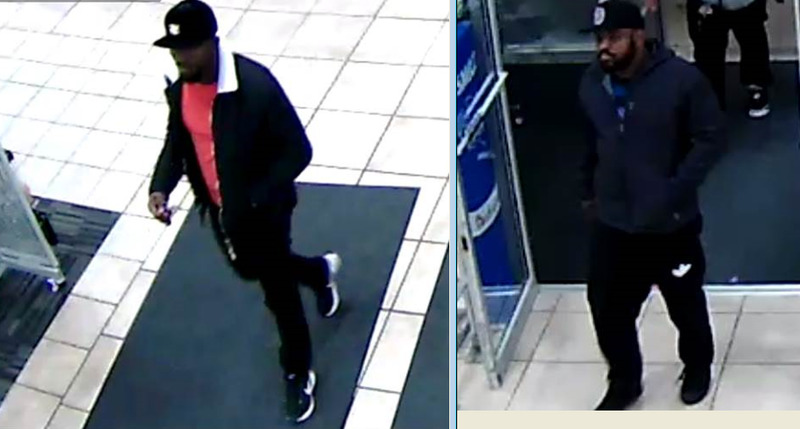 The New Castle County Police are asking for anyone with information as to the identity of these subjects to call (302) 573-2800 or email Officer J. Smith at JKSmith@nccde.org . Citizens can provide tips by visiting our website at www.nccpd.com. Tipsters may also call Delaware Crime Stoppers at (800) TIP-3333 or visit us on Facebook at New Castle County Police Department.